Researchers in Sweden have developed a new technique where you can charge your devices anywhere without electricity, provided there is a water source nearby. Just add a spoonful and get instant power, anytime anywhere. Handy for anyone who spends time away from electricity, the small, lightweight PowerTrekk could power critical devices for warfighters and aid workers deployed to remote areas of the world, Fox News reported. Developed by a team in Sweden's KTH Royal Institute of Technology and made by MyFC, it's the world's first water-activated charging device that powers using fresh or salt water, the developers claimed. It can extend battery life up to 3 watts. So if you take an iPhone, the charge would be enough for between 25 and 100 per cent of its battery capacity. Any convenient water can be harvested for power, from a kitchen faucet through to a puddle in the jungle. Solar charging can be affected by the weather and the position of the sun, of course, and not hugely helpful if your urgent power shortage hits at night. Water charging isn't hindered by these external factors. Even in a desert, a spoonful of water from your thermos can give you power. The new device leverages the team's more than 15 years of research on micro fuel cell technology and small flat Proton Exchange Membrane fuel cells at the Department of Applied Electrochemistry at KTH. 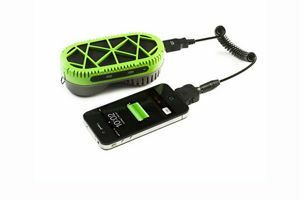 To use the PowerTrekk charger, you fill-up water compartment with about one tablespoon, close the lid and connect it to the electronic device with a USB cable. It starts charging automatically as the water inside interacts with a small disposable metal disc causing hydrogen gas to be released. Instead provided water and air is provided to the electrodes, these fuel cells will run. Very green power, water vapor is the only by-product. Currently, Powertrekk works with devices like cell and smartphones, digital cameras, iPods and GPS. The company is looking into developing their fuel cells to function for larger devices like laptops.